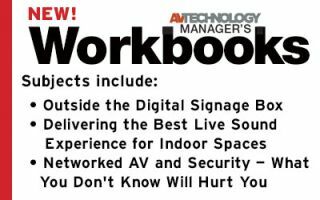 In November 2015, AV Technology collaborated with thought leaders, sponsors, and editorial contributors to create educational sessions on Digital Signage, AV Security, and Acoustics. The sessions took place at InfoComm Connections in NYC. These thought provoking, inspiring sessions included workbooks that supported the presenters and provided the attendees roadmaps to create their unique solutions for collaborative, secure environments. We are delighted to make these workbooks available for you to download, read, and share. Click here or on the cover on the right to read. Listen Up. Audio is as much of an art as it is a science. In the world of integrated audio systems, there is no “one-size-fits-all.” And yet, AV and IT managers are expected to magically appear at a corporate theater, boardroom, or college campus, clip mics on presenters, adjust goosenecks, and ensure a solid sound performance. A good technician needs to know how sound systems work and understand parametric equalization in order to eliminate unwanted ringing. Loudspeaker system design, room acoustics, and the interplay among them are highly complex, but there are essentials every manager must understand. Think of this Workbook as your “sound reference” for distributed audio applications, live sound best practices, and every decibel in between.